Left-right rather than rotational symmetry for this one. That’s because none of the four theme answers is of the same length as any of the others, let alone a two-and-two distribution. 16a. [Hockey team that plays at Staples Center] LOS ANGELES KINGS. 21a. [Super Bowl advertiser with Clydesdale horses] BUDWEISER. 38a. [Luxury watch brand] ROLEX. 53a. [Busy company around Mother’s Day and Valentine’s Day] HALLMARK CARDS. The connection? 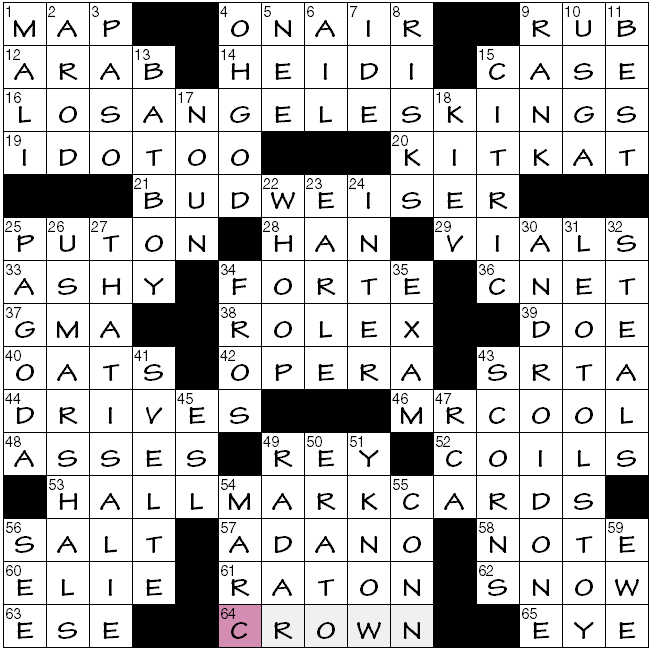 64-across [Royal topper … or part of the logos of 16-, 21-, 38- and 53-Across] CROWN. Also centered across is 49a [Lana Del __, singer with the 2014 #1 album “Ultraviolence”] REY. In Spanish, del rey of course means ‘of the king’, as in corona del rey. Stacked long downs on either side, buttressing the grid: 26d [Fed. fugitive hunters] US MARSHALS (note the single-L), 27d [“NOT true!”] THAT IS A LIE (see also, 19a [“Same here!”] I DO TOO), 30d [Google smartphone released in 2014] ANDROID ONE, 31d [“War and Peace” author] LEO TOLSTOY. 25a [Don] PUT ON, 61a [Betray, as a naughty sibling] RAT ON. >scowl< I feel a (yet another) fill-in-the-blank would have been preferable: Florida’s Boca __. Mis-fill: 51d [“Get what I mean?,” informally] YA DIG before Y’KNOW. SEE also 56d [“Get what I mean?”] SEE. 44a [Golf shots off tees] DRIVES, 10d [Org. whose website has many links?] USGA. A second playful question-mark clue: 24d [Encrypt?] INTER. 17d [Follower of “a” or “the,” often] NOUN. Bleah. Average Monday, despite looking a bit different. I found the meta angle of this puzzle to be pretty easy, but that doesn’t diminish my admiration for the meta’s elegance. The clues take you to a grid with six rebus squares, each containing the letters IN in both the Across and Down answers. The first rule of cracking a contest/meta puzzle is Read the Puzzle’s Title. The title generally relates to the meta answer, but the connection won’t always be clear till you’ve cracked the code. Here, the “Trade-Ins” title actually pointed me directly at the solving approach I needed: swap each IN for something else. Looking at the first rebus square, STABS/BORDER popped out (You know how many common words have the *ORDER pattern? Not many). Working through the other rebuses, I settled on SAGE/’TWAS, SPROUT/RAPT, MIGRATE/OPTION (a particularly nice find! ), SATE/CHEESE, and HOLSTERS/CHAR (it helps that I had pondered whether HOLSTERS could possibly fit the clue when I’d gotten the first few letters). Put the letters together, in order from upper top to bottom, and you get the very apt BARTER, which is the correct answer to the contest. I’m still trying to figure out how much data mining and thinking it took to assemble a list of word pairs that could intersect at both an IN and another letter, settle on a workable set that spelled out a highly relevant word, and place those six pairs in the grid with rebus squares in order from top to bottom—and have the grid be perfectly fine, no terrible compromises. You could be churlish and ding the puzzle for not having the rebus squares/entries in symmetrical spots, but (1) that was probably impossible to pull off given the theme constraints, and (2) it’s fine to up the challenge in a contest puzzle by not putting rebus squares in predictable spots. Five stars from me. Elegant, like so many other Fireball contest puzzles, NYT contest puzzles, WSJ puzzles, ACPT puzzles, and A-Frame Games puzzles by Patrick. Unusual not to have a revealer for an early week theme such as this one. In any case, the four asterisked entries each begin with a synonym for ‘angry’. 20a. [*Publication featuring Alfred E. Neuman] MAD MAGAZINE. 11d. [*Flu symptom] SORE THROAT. 57a. [*Chinese food staple] STEAMED RICE. 29d. [*Lines that help you 9-Down] CROSS HAIRS. (9d [Get ready to shoot] TAKE AIM.) I here reassert my dislike for commingling between theme and non-theme clues. This arrangement of theme entries is often referred to as a pinwheel. Pinwheels put me in mind of windmills, and windmills in turn recall Holland, and TULIPs (40a [Garden bulb]). Elsewhere, 41-down—oh, THERE’S the revealer—[Personal source of annoyance … which might make one feel the first word of the answers to starred clues] PET PEEVE. Silly me, I didn’t consider one of the long answers as a location for the revealer. Its symmetrical partner has no relation to the theme: 5d [Didn’t follow the script, say] WINGED IT. Unless you consider an unconventionally placed revealer to be a strong example of going off-script, that is. 15a [In couch-potato mode] IDLE, 59d [Big screen star] IDOL, 46d [Starring role] LEAD, 31d [Worship] ADORE. 22d [Big name in ATMs] NCR. I’ve finally learned to remember this acronym, discovering it derives from the National Cash Register company. Crossword’s fairly clean, at the level of a typical Monday offering. Nothing to get riled up over. Good morning, everyone. First of all, I welcome you all to have some virtual birthday cake that’s sitting here on this virtual counter top. (I feel uncomfortable just saying, “It’s my birthday today!” flat out, so that was the best way I knew how to do that.) Anyways, today’s crossword puzzle, brought to us by Mr. Randall J. Hartman, includes theme answers in which the letters “TERM” is embedded consecutively within the entries and spanning two words. MONSTER MASH (64A: [1962 chart-topper by Bobby “Boris” Pickett]) – If you ask nicely, I’ll tell you about the time in fifth grade when I turned down the lead role to a Halloween school play to play a Ghostbuster who danced to “Monster Mash” at the very end of the play. Seriously. “Sports will make you smarter” moment of the day: GATORS (70A: [Gainesville athletes]) – The nickname of University of Florida athletics is GATORS, and the school is one of the preeminent schools in the country when it comes to winning championships. Their most recent national championship came when the Gators’ softball team won its second consecutive national championship earlier this summer. Some of the more well-known athletes who went to the University of Florida include NFL Hall-of-Fame running back Emmitt Smith, two-time U.S. Open-winning golfer Andy North, all-time international soccer leading scorer and 2015 World Cup winner Abby Wambach, and some guy named Tim Tebow. Ever heard of him? People of Earth! The daily Wall Street Journal crossword has commenced! For now it appears there are two ways to solve: on paper via your friendly neighborhood PDF or via the un-caffeinated Java applet. No puz or jpz files yet, it seems, but hope springs, if not eternally then at least for a period. Let’s welcome the newest daily newspaper crossword offering with a review. So as not to spoil the goods in case you’d like to have a go at the puzzle, the solution grid (in this reviewer’s handwriting no less) is saved for a few paragraphs. The Journal today launches a major expansion into the world of puzzles, with a daily crossword, a new weekly crossword contest, an ingenious weekly crossword variant, and a new weekly math quiz, created by New York’s National Museum of Mathematics. The new lineup starts with a daily crossword Monday to Friday, from a roster of the nation’s best constructors overseen by puzzle editor Mike Shenk. 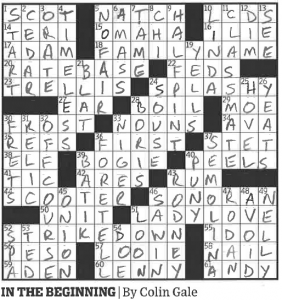 The Friday crossword features a contest: a “puzzle within a puzzle” for you to solve (usually a single word or phrase such as a celebrity’s name, a country or a movie title). We’ll randomly draw a winner each week from the correct solutions. 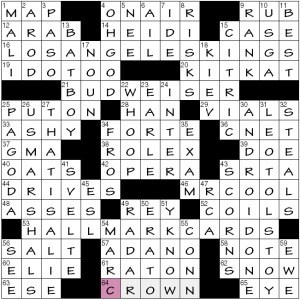 On Saturday you’ll find a large weekend-size crossword, plus a second specialty word puzzle. In addition, you’ll find the Department of Mathletics, a weekly math quiz created by the National Museum of Mathematics. Looking forward to all the forthcoming fun! On to today’s review. 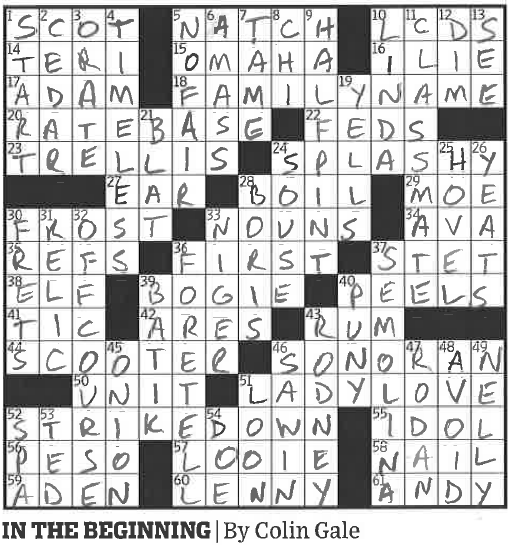 Fitting that the byline belongs to Colin Gale, one of editor Mike Shenk’s familiar crossword aliases. That tells you it’s safe to solve–this series won’t start with a BLAT ([Sour note from a trumpet]). 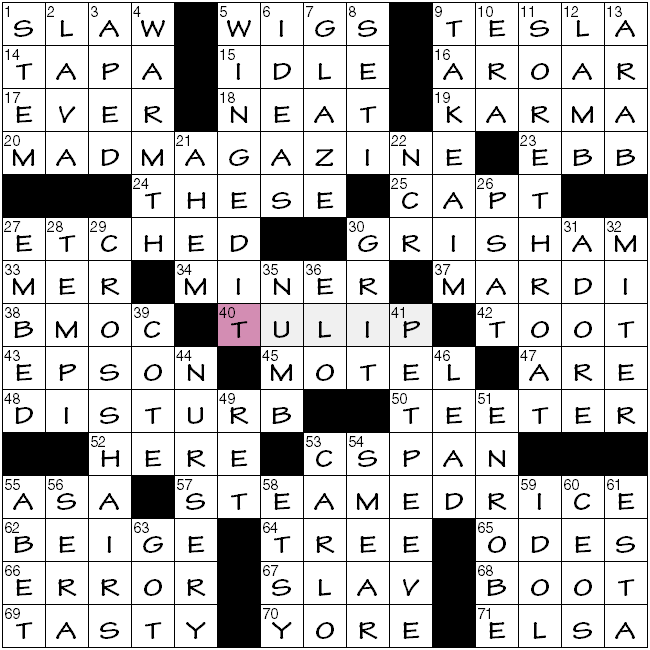 The theme of this 76/34 crossword is apt both for a Monday and for being the first in what we hope is a long line of daily puzzles (“daily” meaning Monday through Saturday, as the Wall Street Journal does not publish a Sunday paper; as we say in Atlanta, they “pull a Chick-fil-A”). 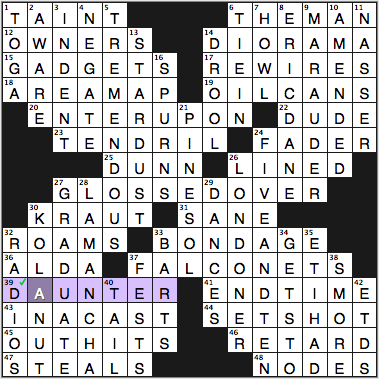 36-Across says that FIRST is a [Word that can precede each half of each starred clue’s answer]. There are six theme answers, more than the typical three-to-five in most early-week puzzles. The theme answers even intersect and lie partially atop each other (now that’s just showing off, Mike). 18-Across: FAMILY NAME, clued as [Smith or Jones, for example]. Which member of the First Family has a first name that does not end with a vowel? 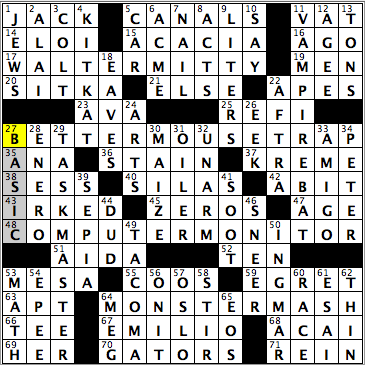 20-Across: RATE BASE, the [Valuation of a public utility]. The ballplayer played first-rate defense covering first base. 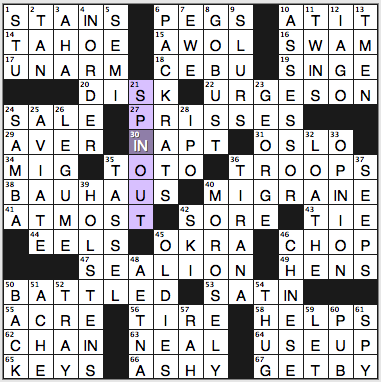 52-Across: STRIKE DOWN, clued as [Invalidate, as an unconstitutional law]. The offensive unit made the first strike with a long pass that set up a first down. 11-Down: CLASS MATE, a [Yearbook signer]. I know this more as a compound word than a two-word term, so I wonder if this is a mild inconsistency. Oh yeah: While flying in first class I had a conversation with the first mate. 32-Down: OFF COURSE, [Veering from the intended path]. First off, we will enjoy an appetizer, the first course. The high thematic density is not immediately obvious because the fill is hella smooth. Little jumps off the page as especially sparkly, but nothing makes you wince either. Today’s record-breaking solving time (seriously, I’ve never had a faster time on the WSJ daily puzzle) would have been even faster if I had read the clue for SONORAN correctly. I saw [Desert known for its saguaro cacti] as [Dessert known for…] and couldn’t get past the image of cactus for dessert. Oh well. Maybe I’ll set a new record tomorrow! Favorite entry = HALF-PINT, the [Epithet for a small person]. Favorite clue = [Diving bird with an eerie call] for LOON. It’s wonderfully evocative. You may have noticed that I seldom get around to blogging this puzzle till the afternoon or evening. For the last month and a half, and the next month and a half as well, I have a standing Monday-morning date with a phlebotomist. By the time I get home, I have forgotten that crosswords exist. I did like THE MAN, GLOSSED OVER, TREMENDOUS, Ziggy STARDUST, ERIC DANE, FIVE AND TEN (my grandma called it the “five and dime”), and S’MORE, which reminds me I should put graham crackers, marshmallows, and chocolate bars (not Hershey’s crap) on my shopping list. … Done! Will walk to the store later. Never heard of 25a. [Bassist Donald “Duck” ___], DUNN. Not unusual to encounter a musician I don’t know in a BEQ. I actually did recognize 35d. [Middle East airline that sponsors the jerseys of New York City FC and Manchester City], ETIHAD. It helps that my household is two-thirds English Premier League fans. Did not know there was such a thing as FALCONETS (37a. [Tiny South American birds of prey]), but it was gettable from the clue. I finished the puzzle with one wrong square. For 39a. [Intimidating sort], I had TAUNTER crossing RATIOS. TAUNTER is terrible fill, but so is DAUNTER, and daunting is less of an active verb than taunting. Would have appreciated a more direct clue for RADIOS than 32d. [They help you get with the program]. You know, I felt like there were lots of roll-your-owns while I was solving, but really, there’s just DAUNTER. MARAUDER, LONDONER, and FADER are all rock-solid, and REWIRES and RETARD aren’t awkward RE+verb words. Four stars. Surprisingly smooth, aside from DAUNTER, for a 58-worder. This entry was posted in Daily Puzzles and tagged Brendan Emmett Quigley, C.C. Burnikel, Colin Gale, Janice Luttrell, Mike Shenk, Patrick Berry, Randall J. Hartman, Zhouqin Burnikel. Bookmark the permalink. Happy birthday, Ade, and thank you for your entertaining and informative write-ups! Don’t forget the amazing athlete Benjamin Coe, who also attended university of Florida. welcome to the wsj daily! sam, are you going to be blogging it every day, or just today? I probably can’t commit to every day, Joon, but I’ll be happy to cover it when I can. If someone wants to start a rotation, I’m happy to participate. I’m no ace but I can be a capable #3 or #4 who eats up innings. Do you know what the difficulty level will be? Thanks. Will check it out when the Java applet works for me. Joon, you desperately need to update the URL your link points to.